On the 15th of May we visited the Quarter Colliery and examined all the parts of the mine in any way connected with the accident. After due advertisement in the "Scotsman," ''Glasgow Herald," and local newspapers, the inquiry was opened on 3rd June, 1895, and was concluded on 5th June. 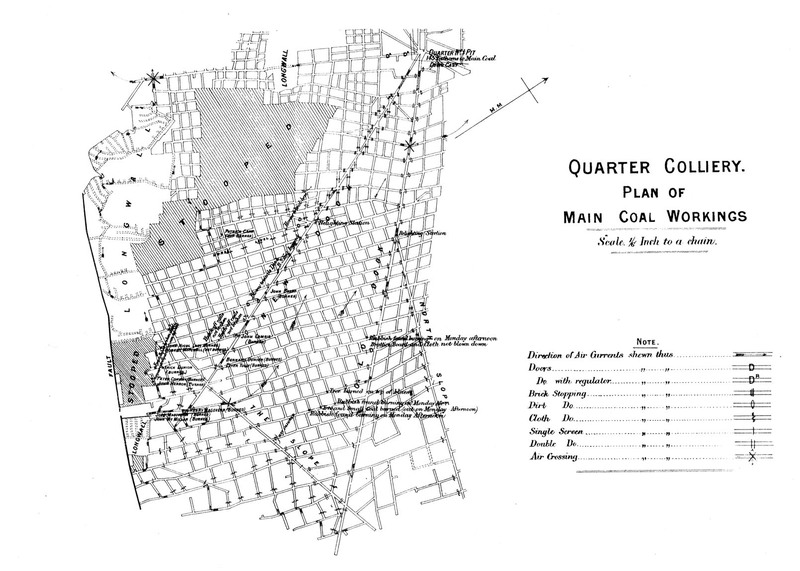 The mine-owners were represented by Mr. Graham Murray, Q.C., instructed by Mr. Stuart-Foulis, Writer, Glasgow. Mr. J. Jeffrey Hunter, Writer, Glasgow, appeared for the relatives and representatives of deceased miners with the exception of John Busby, and Mr. B. Chisholm Robertson represented the Forth and Clyde Miners' Association. The evidence was recorded in shorthand; and we were satisfied that the statements of the 35 witnesses examined embraced the whole material evidence now procurable. We forward herewith the notes of evidence. We also forward copies of a plan prepared by Mr. McCreath, M.E., for the mine-owners, which was accepted by all parties as substantially accurate [Click here to view]. The report books were also produced and an excerpt taken therefrom of the entries between 1st August, 1894, and 1st May, 1895, which, it was explained, referred to gas, is forwarded herewith. The last entry of gas being found before the explosion is on 19th November, 1894. In the case of all these entries it was impossible without explanation to know whether the statement applied to the finding of gas or to a defect in ventilation or in the condition of the roof and sides. Patrick Carr - Tin match-box half full of matches; and contrivance for opening lamps. John Comrie - Split nail for opening lamps. Peter Conway - Seven matches and split key for opening lamps. Patrick Dunion - Split nail for opening lamps. John Herron - Clay pipe and piece of tobacco. Henry McGovern - Tin match-box half full of matches. Robert Mitchell - Clay pipe and piece of tobacco. John Nicol - Wooden pipe, piece of tobacco, one match, and a box half full of matches. The lamps used by the deceased on the day of the accident were produced by the mine-owners. The history of the pit, so far as necessary for the present question, is as follows:- It was sunk about 30 years ago, and the Blackband ironstone lying about 30 fathoms above the coal was at first alone worked. Then the pit was sunk to the Bannockburn Main coal seam, and from 1873-4 to 1879-80, it was worked both for coal and ironstone, and since 1878-80 for coal alone. The mine was worked partly by longwall, partly by stoop and room, and near the place of the accident it was worked by stoop and room. At the time of the accident there were fully 170 men engaged in the pit. The depth of the down-cast shaft is 145 fathoms to the main coal. The up-cast pit, 67 1/2 fathoms in depth, is provided with a fan, which is of the open running type, 12 feet in diameter, and it usually ran at speed of 103 revolutions per minute, with a water gauge of one inch. Until five years ago the mine was worked with naked lights. In 1889 the inspector desired the use of safety lamps. This was resisted by the mine-owners, but on a reference under section 47 (4) of the Coal Mines Regulation Act. Mr. R. T. Moore, the arbiter appointed, ordered the introduction of safety lamps, which have been regularly used ever since. The lamps used are known as the Protector Marsaut Lamp, burning naphtha for 16 hours. Their design as lamps is unexceptionable. They are one of the four lamps recommended by the Royal Commission of 1877. In addition to the ordinary characteristics of the Marsaut Safety Lamp they are so constructed that they cannot be opened without the light being extinguished. They appear to have been regularly kept in good working order, and all the lamps of the deceased were, after the explosion, tested in explosive gas and found to be in a safe condition. We saw no reason to doubt that the officials of the colliery were thoroughly competent for their respective duties. Referring to the plan, which only shows part of the dip workings, the men whose lives were lost were employed either in the New Dook or in the working places to the south-west thereof. The air current for the south-west side passed down the New Dook and up the faces, as indicated by the arrows, part of the current going through the stooped waste to the rise of the horse level, part up the airway through the old longwall workings, and along the working faces to the rise ; while a small portion passed up between the stooped waste and the New Dook, and joined the intake air going in the south level. The haulage in the dip workings is done by an endless rope passing down the upper part of the Old Dook, down the north slope, across from thence to "The Slope,'' up which it passes and thence up the New Dook to the pit bottom. All the empty hutches go down the Old Dook, and the full hutches up the New Dook. No work was being done between the New and the Old Dooks, the return air from the men employed in the extreme dip workings passing up through these workings. The workings between the two dooks were dry and dusty, as were also the working places of the men who lost their lives in the under section of the New Dook, and most of the roadways leading thereto. The circumstances connected with the accident may be next noticed. On the morning of the day in question, 26th April, 1895, the usual and proper examination of the pit seems to have been made by the firemen. The men, about 170 in number, were at work, when, about 1 o'clock pm, first one explosion took place in the New Dook section, and then, at the interval of from half a minute to three minutes, another explosion in the same part of the mine. All the men, twelve in number, engaged in the workings below the Horse Level in the New Dook were killed by burning, by afterdamp, or by violent contact with material, and one man, Patrick Carr, engaged in the workings called "Martin's," above the Horse Level, was killed by afterdamp. The other men in Martin's workings escaped uninjured. The pony drawing the hutches along the horse level to the New Dook Haulage Road was living when found by the exploring party, but could not be got out alive. We are satisfied that after the explosion every possible effort was made for the rescue of the men in the section of the mine where the explosion occurred. The cause of the accident remains for consideration. The immediate cause was, undoubtedly, the ignition of firedamp by a naked light, the conditions of temperature being such as to exclude the possibility of spontaneous combustion. If so, how did firedamp, sufficient to cause an explosion., come to be present in the workings?, and how was there a naked light in a mine where naked lights were prohibited except at the pit bottom ? The first of these questions is obviously one which falls to be answered by the mine-owners, on whom alone, in ordinary circumstances, could any responsibility rest for so dangerous a condition of matters. It was for them to show that there had been no dangerous accumulation of gas in the workings, and that a sufficient current of air was provided to render harmless any ordinary outburst of gas, even if, contrary to the rules, a naked light was present in the workings. The place where either the first or the second explosion originated has not been absolutely ascertained. In all probability, however, it must have been either in the road where McMillan and the two McGoverns worked, or in the road where Conway and Herron worked. It will be observed, by referring to the plan, that only a screen separated the intake air at the foot of the New Dook, and the return air from the workings to the extreme dip. On the 29th and 30th April it was found that there was an accumulation of explosive gas to the dip of this screen, and it appears that none of the officials had been in the workings immediately to the dip of the screen for a considerable time prior to the explosion. The lamp of Henry McGovern was found four yards to the rise of this screen and his body 11 1/2 yards farther up the dook than his lamp. There is no proof of there having been either any sudden outburst or any known accumulation of firedamp in any part of the workings, or waste adjoining thereto; but if there was gas accumulated behind the screen referred to not necessarily in very large quantity, some of it would probably leak through the screen, and if in such circumstances any person went close to the screen with a naked light an explosion would be likely to follow. On the body of Henry McGovern, who had previously been convicted of having had a pipe in the mine, there was found a box of matches, and we think it possible that, by going down towards the screen and striking a match there, he may have been the cause of the explosion. The explosions do not appear to have been of a very violent nature. The roof of the roads to the working places of the deceased miners in many parts fell to a height of about a foot, although in some parts it fell more heavily. Almost all the stoppings on each side of the New Dook below the relighting station were blown out in the direction of the Old Dook. In the working places of Conway and Herron the blast went towards the rise, while it went to the dip from the point where Henry McGovern's body was found. There was no evidence of force in the workings between the two docks, although the fire must have traversed these workings, as shown by the props, screens, &c., close to the Old Dook having been set on fire. We think it proved that a sufficient examination was made of the places of the deceased, and the roadways leading directly to them, on the morning of the accident to have revealed the presence of dangerous quantities of explosive gas had such been present, and that no such quantity of gas was, in point fact, present. We think that at the time of the accident there must have been either an outburst of explosive gas or an unknown accumulation of firedamp, either in the waste adjoining the stoops being extracted or some other part of the workings which had not been inspected by the firemen and which it may not have been necessary for them to inspect. The chief controversy arises on the other branch of this question, namely, was there sufficient ventilation in the New Dook workings, to render harmless any ordinary outburst or accumulation of gas there, even if, contrary to the rules, a naked light was present in the workings ? We have found this question attended with some difficulty. The amount of air entering the mine by the downcast shaft appears to us to have been sufficient if properly conducted through the workings. It is, of course, inevitable that a considerable amount of the air directed along the roads and round the working places should "scale" into unused parts of the mine. It has been suggested,however, that in the case of the New Dook the amount of air so "scaling" was so great as to leave an insufficient quantity for the due ventilation of the roads and places where the men who lost their lives were travelling or working. A large body of evidence was led on this point, which deserved and has received our most careful consideration. On the one side it was maintained that the dirt stoppings along the New Dook should either have been tighter, or, as has been done since the explosion, should have been replaced by brick stoppings; and that defective ventilation was proved by statements and complaints which had been made before the explosion by some of the men who were killed as well as by certain other miners, who, it is said, not only complained but left the work on account of this insufficient ventilation. On the other side it was alleged that the dirt stoppings originally carefully constructed, had had ample time to consolidate and were sufficiently consolidated ; that similar dirt stoppings had been found effective in other parts of the mine and are in ordinary use in similar situations in other mines, and that the sufficiency of the ventilation in the places where the thirteen men were killed was proved by the fact that in the longwall workings and in Martin's stoops, which are ventilated by substantially the same current, the ventilation had always been found sufficient. In our opinion, however, the mere fact of the ventilation in Martin's section and in the longwall workings to the rise thereof being sufficient is no conclusive proof that the workings where the majority of the men who were killed worked were also adequately ventilated. At the time of the accident the mine- owners' arrangements for leading the air coming from Martin's stoops through the part marked "stooped" on the plan were not in our opinion satisfactory, seeing that the return air had to pass through the fallen waste, which might have been practically closed at any moment by a fall of roof and which was bound to close completely as the stoops were extracted. We think it' should have been possible for the firemen to ascertain by actual inspection and not merely to conclude by inference that the air was obtaining sufficient passage through the stooped portion. For a considerable time previous to the explosion the return airway appears to have been at several points very contracted in its area, and as practically the whole of the air current which reached the section where the explosion happened had to pass up this airway or through the stooped waste through which no one could travel, there could not in the circumstances have been a large quantity of air circulating. That this was the case was further confirmed by the fact that after the explosion when attempting to reach the deceased miners, the explorers noticed that very little of the air current passed through the blown-out stoppings to the south west of the dook, and it was feared that a fall had blocked the airway, although it was afterwards ascertained that such was not the case. At the same we see no evidence that there was in point of fact at the time any such obstructions there to the passage of air as to preclude sufficient ventilation in ordinary circumstances. Otherwise, the ventilating arrangements of the mine seem to us to have been satisfactory and we are therefore led on a consideration of the whole evidence to the conclusion that the accident cannot be attributed to the absence of ventilation, which the mine-owners were bound under the Mines Regulation Act and the special rules to provide. As above indicated, we attribute the accident primarily to firedamp, but at the same time we are of opinion that the explosion was much intensified by coal dust. This was disputed by the skilled witnesses for the mine-owners as well as by the officials of the mine, chiefly because the explosion was accompanied by least traces of fire in "Comrie's Road" where the dust lay thickest, and on the ground of the two two explosions with a sensible interval between. If, as contended by the owners and some of their witnesses, the explosion was one of firedamp alone, there must have been a very large accumulation of gas for the flame to have swept across from the seat where it originated to the Old Dook and there ignited props and screens. It was not suggested that there could have been such an accumulation in the course of a return airway and the presence of the coal dust in our opinion sufficiently accounts for the distance to which the explosion extended. The cause of the second explosion has not been satisfactorily explained, any more than the fact that while props, screens, and coal, at and near the Old Dook were ignited by the explosion, the wood on the roads intervening between the two dooks presented no appearance of fire. But we see nothing in the fact of two explosions to exclude the agency of coal dust. The first explosion may have resulted from ignition by a naked light of explosive gas intensified by the presence of coal in the immediate neighbourhood; while the second explosion, however it originated, may also have been greatly intensified in its action by coal dust. If coal dust in a dry state contributed to the disastrous result, were the mine owners to blame for the dry condition of the coal dust in the New Dook at the time of accident? In view of the fact that, as aftermentioned, the cause of the of the explosion cannot be attributed to the firing of a shot, and that neither the General Rules nor the Special Rules provide for watering dry and dusty places except when a shot is about to be fire, we cannot connect any deficiency in watering to the accident. We think, however, that in all fiery pits containing, like this one, considerable areas where there is abundant coal dust not made damp by natural moisture, provision so far as reasonably practicable ought to be made, at least in all the working roads, for artificial watering. We have stated above that the accident must have been caused by the ignition of firedamp by a naked light; and we have now to consider the question of how a naked light came to be in the workings. Four suggestions have been made. First - a shot may have been fired. We think this excluded, because, at the only place where evidence was found of a shot having been recently fired, the tools and lamps were lying much closer to the face than they would have been left prior to the firing of a shot. This makes it unnecessary for us to consider the question which was raised in the evidence of the propriety of the use for blasting in the working places of powder rather than carbonite. Second - A miner may have been working with a naked light or an opened lamp. The list of prosecutions does not suggest that men ever worked surreptitiously with naked lights, and the piece of wick found in the workings proves nothing; while the fact that all the lamps were found after the explosion securely closed makes it certain that no attempt had been made to open the lamps. Third - A miner may have struck a match to relight a lamp which had gone out. This may also be dismissed, because, before doing so, the lamp would first have been unscrewed; and all the lamps were found screwed tight and locked. Fourth - A miner may have struck a match, his lamp having gone out, to see where his lamp was, or to find his way out; or he may have struck a match to light his pipe. So far as it is possible to come to a conclusion the presence of a naked light seems to have arisen in one or other of these ways. If so, the question of the construction of the lamps employed in this mine does not properly arise. We think it right, however, to observe that the evidence led in this case has confirmed the views expressed by us in our report on the accident which took place at Herbertshire Colliery, Denny, on 30th June, 1893, as to the propriety of fitting lamps, whatever their construction may be, with appliances for ascertaining whether they have or have not been opened. In this case, as already mentioned, contrivances for opening the lamps were found on the bodies of Patrick Carr, John Comrie, Peter Conway, and Patrick Dunion, four out of the 13 men who were killed. The explosion in Herbertshire Colliery was due to the habit of miners carrying matches to be used either for lighting lamps or pipes. As already mentioned, matches or pipes, or tobacco were found on the bodies of Patrick Carr, Peter Conway, John Herron, Henry McGovern, Robert Mitchell, and John Nicol, six of the 13 men who were killed. We previously ventured to suggest in our report on the Herbertshire accident, whether the punishments by fine ordinarily inflicted in the Sheriff Court on miners offending against the regulations regarding the use of safety lamps were adequate, and whether imprisonment should not in suitable cases be inflicted. The evidence in this case and a consideration of the list of prosecutions produced by the Sheriff Clerk, 10 in number, between 14th June, 1892, and 22nd May, 1894, has deepened the conviction previously expressed. We are of opinion that in Stirlingshire it has been proved that fining the workmen for offences of this nature has no effect in making them comply with the necessary regulations for safeguarding their own lives, and that it is imperative that imprisonment without the option of a fine should be the sentence in all cases of wilful contravention. Especially in cases of second convictions, imprisonment ought to be awarded instead of fines, no part or only a small part of which may be paid by the offender himself. In suitable cases, moreover, these offences ought to be libelled by the Procurator Fiscal not only under Sections 49 and 51, but also under Section 60 of the Coal Mines Regulation Act. On the whole matter, we have to report that in our opinion the explosion at Quarter Pit on 26th April, 1895, resulting in the loss of 13 lives, was caused by the ignition of an accumulation or an outburst of gas coming in contact with a naked light (other than an opened safety lamp) which had been unlawfully kindled, either by the fireman John Nicol, or by one of the miners who were killed. In our opinion the intensity of the explosion was aggravated and its area extended by the ignition of coal dust. Disastrous pit Explosion Near Dunipace – Loss of Thirteen Lives - About one o'clock yesterday afternoon a terrific explosion occurred in the Quaretr Pit, Dunipace, the property of William Baird & Company (Limited), Gartsherrie, which resulted in serious loss of life. At the time of the explosion there were 177 men in the pit, and when the ominous sound was heard and the dense cloud of coal dust was seen issuing from the shaft, consternation spread around, and the gravest fears were entertained as to the fate of the men. The news of the accident spread quickly, and the people of the district flocked to the pit bank. Meantime the miners were being as fast as possible brought to the pit-head, and shortly after two 161 had been landed on the surface but at this point there was a pause. It transpired that the seat of the explosion was in the new dook section where the long-wall system is in operation. and that the men who were missing were working there. The men who had reached the bank in safety spoke as to the violence of the explosion, a number or them having been knocked down by its force. It was felt all over the pit though the working's run to extreme distances. The new dook section is over 400 fathoms from the bottom of the shaft, and the pit is about 140 fathoms in depth. Companies of explorers were soon organised, and their work was fraught with much danger. The workings have been much wrecked. Another danger after-damp presented them from penetrating to the extremity of the section. An hour had passed, when Francis M'Donald, one of the explorers, came to the bank somewhat exhausted, having gone too far in the foul air. He discovered a horse lying dead at the mouth of the dook. This discovery excited the worst fears, and the state of excitement of the people at the pit-head was painful in the extreme. Many of the women were crying bitterly, and they at least had lost all hope that any of the missing men would be brought up alive. Their names are- Patrick Dunion and Bamey Dunion (brothers), John M'Govern and Harry M’Govern (brothers), John Comrie, Peter Tullie, Patrick Kerr, John M'Millan, Robert Mitchell, John Nicol (fireman), John Busby, Peter Connaway, and John Heron. Shortly after four o'clock news reached the bank that the body of John Busby, residing at Gladeshouse, Dunipace, had been found on the dook road, and this intelligence almost blotted out all hope for the remaining twelve men. Busby’s head was shattered by the explosion. He leaves a widow and five children. The work of exploring was continued but the bad condition of the workings prevented progress. Mr Alexander Easter, underground manager, conducted operations below, and Mr John Brander, manager, superintended above ground. Procurator-Fiscal Welsh, Stirling, and Superintendent Grant, arrived on the scene about five o'clock. Drs Joss and Lumsden, Denny, were also present; The majority of the men still below reside in Stirling Row, Dunipace, and they are all married men. Busby’s body was brought up at six o'clock, and there was at that time hardly the slightest hope of any of the others being alive. It is sixteen years next month since there was an explosion of any extent in this pit, when two men were killed. The working where the explosion occurred has a depth of seam of five and a half feet, and the pit on the whole is not regarded as a fiery one, though worked with a safety lamp of the latest pattern. The Denny Pit Disaster - On Saturday morning the bodies of Peter Conway, John Heron, Patrick Dunnion, John Comrie, Robert Mitchell, and John Nicol were brought to bank. All the bodies were got on the main road. The explorers reached to near the “face,” but progress was stayed by an accumulation of debris. The body of Henry M'Govern was found shortly after ten o'clock, and was immediately conveyed to the pit-head, and in the evening the bodies of John M'Govern and John M'Millan were brought to bank. Only one body is now to recover - viz., Patrick Kerr. The following telegram was received on Saturday by Mr Ronaldson, mines inspector, with reference to the Denny disaster:- "Mr Asquith expresses deepest sympathy with the sufferers and their families; and anxiously awaits further information." Yesterday afternoon and evening Denny, and Dunipace were crowded, and the scene of the disaster drew crowds thither. At eight o'clock last night the remains of nine of the men, members of the Roman Catholic Church, were conveyed to the chapel, two lorries draped in black and white being used for the sad office. The chapel was draped in black and white, and the coffins were laid in front of the altar. A most impressive service was conducted by the Rev. Father Rooney. The funerals take place to-day. The Quarter Pit Disaster - Yesterday afternoon eleven of the bodies were buried, and the funeral ceremony occasioned a gathering the like of which had not previously been witnessed in Denny district. Six were interred in the Denny Cemetery and five in the old kirkyard of Dunipace. Mass was celebrated in the Roman Catholic Chapel. The chapel was filled to excess, and the beautiful little edifice was suitably draped for the occasion. Father Rooney was assisted in the service by Father Easton, of Linlithgow. At four o’clock the coffins were conveyed in hearses to the burying ground. In front of the hearses was a company of some fifty girls dressed in white, and several boys carried banners. On the way the children chanted hymns, and the effect was most impressive. “Dear Mr Welsh, I am much grieved to read of the sad disaster which has occurred at Dunipace, with, I fear, a loss of thirteen lives. I know that a donation, however small, if it be at once available; is sometimes the means of alleviating such distress as must ensue among the families of those who have been so suddenly and sadly removed. I shall be much obliged if you will place this cheque in the hands of the ministers of the different denominations to which the sufferers belonged in the hope that though of small amount, it may be of some use.—Believe me, yours faithfully, (Signed) Montrose."